GNOME Media Player supports the VLC, Xine and Gstreamer engines for playing media. It also has the ability to switch between the engines, and an engine auto select mode which automatically selects the best engine for playing a particular type of file. 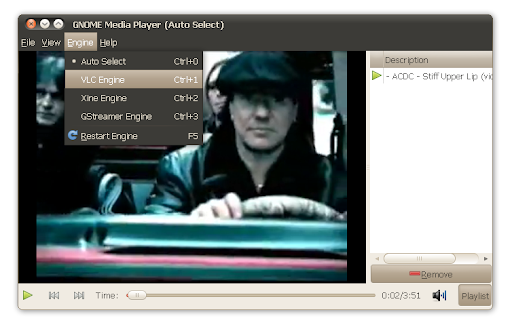 GNOME Media Player is very new so until now you had to use a PPA to install it in Ubuntu - but that's not the case in Ubuntu 10.10 Maverick Meerkat as GNOME Media Player has been included in the Official Ubuntu repositories. Gnome Media Player requires VLC < 1.1.0 (libvlc2 to be more specific - this is now libvlc5 in VLC 1.1.0) so if you've added the WebUpd8 PPA and installed VLC 1.1.0, use PPA Purge to remove it (you can then safely re-add the WebUpd8 PPA as VLC 1.1.0 has been removed from the PPA due to many issues with it).